As you can tell, I kept my mile splits pretty equal especiall miles 3,4 & 5. My final 4 miles were covered in 23:40 or 5:55 pace evenly. My legs felt tremendous on this run, I wish my half marathon woulda been today because 1:20 would have been shattered. I like this starting slower and speeding it up thing. The temperature was conducive to a good run, 53 degrees, but it was super windy at 20-25 mph. Words cant express how happy I am with this run and what kinda shape it shows Im in!! Broke out the old orange shoes today, glad they still had 3 miles left in them. 48 degrees with rain and wind..yum, winter is coming. I wore tights and was glad I did. Total: 21:33, or 7:11 pace. Pretty even run, felt like I was going a lot slower than this, but I guess I wasnt, hopefully that means Im in pretty good shape! Overall a good run. Felt fine, legs did take a while to warmup but I found a groove in the middle of the run. Popped a GU around 8.75 miles in or so, definitely added a boost for the last 4. Half Mary 2 weeks from today! Overall a really evenly paced run. Felt like I was taking it easy and tried after the first mile to consciously slow it down, just couldnt get much slower than 7:17. Tomorrow will be a few miles at GHMP. 4 mile tempo today. It was neither about speed or distance, just about running some more consecutive miles at GHMP. That is what I did, running the 4 miles in 24:12 or 6:03 pace exactly. 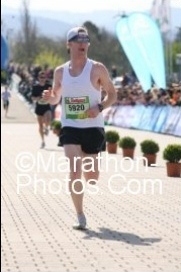 I was not happy with the way I felt in this run though. I started off fine, then felt tired. The cold (46 degrees, w/c of 38) and wind (20-30 mph) didnt help either. It was still a quality workout though and I am happy with it. Overall a good steady workout. Im sure my legs were just tired from high mileage last week. Will get in 4-5 easy tomorrow, then another longer tempo on thursday with some more GHMP miles. 5 super easy miles today. Super easy pace-wise that is. I was super tight and my legs just werent fresh, which is probably why I knew that I would just take a relaxing 5 mile jog today. Ran the 5 miles in 37:53 or 7:35 pace. Overall, it was a gorgeous day to run. Mid-60s, light breeze, just a wonderful day. It felt nice to take it easy for once, it just kinda made the 5 miles drag on. Tomorrow will be more GHMP miles tho, so itll be back to business. All in all, not a bad tempo, by far the best pace Ive held for that long. Felt pretty good throughout, just have to reign it in the first couple miles so I dont start adding time towards the later miles like the trend was beginning to look like here. 3 easy, felt like I was jogging today. Weather was really nice, but its sposed to be snowing for my 14 tomorrow. TOTAL--1:46:10 or 7:19 per mile pace! Overall, a very good run in adverse weather conditions. I got in a groove in the middle miles as you can tell by my even splits from 5 through 10. Aside from the last mile which was uphill and I was dead, I kept a pretty decent pace. Not only was it the farthest Ive ran in terms of distance (by .5 mile) but it was the longest as far as time by seven and a half minutes! Goal HM next week! 5 easy paced miles today. Legs felt like crap though, dunno if it was the cold or just leftover from saturdays long run. Anyways, hopefully slowing it down today will act as a recovery and iron out the kinks. Taking it easy this week as a taper for the half. total--37:24 or 7:29 per mile. Finished with 6x50 meter strides. Hopefully my legs will come back to me as the week goes on. Overall, I was happy with my pace, it felt really easy. I just need to slow it up for the first mile, the second mile was 6:10 but i was more than happy with that because I felt like I made an adjustment after the first mile which is what I'll need to do saturday if i get out to fast. My goal for saturday is to start at 6:10s then about the 4th mile, drop it down to around 6:00 and see how fast I can push the rest of the way, that is how ive trained and that recipe should yield a sub1:20. Last real workout before the big race on saturday. 6 miles in the cold rain. I dont know whether I can trust the weather forecasts for saturday because it says its sposed to be nice but last night they said 95% chance of rain at 8pm and it didnt rain all night. Tonight, they said 70% chance of rain at 4 and boom rained right at 4. Who knows. Overall, a good final workout before the race. Quads are still sore and have been all week, the day off tomorrow will help and then Ill get an easy 2 in on friday. Now its just time to trust my training and go out on saturday and rock the 13.1! Woke up at 5:30, hopped in the car about 6 and got to sioux city about 6:40. Hopped aboard a bus when I got there that took us to the start line. First time taking race transportation, and it was a good experience--plus it was very warm on that bus! Warm-up felt really good and I had a standard pre-race routine. Started out fresh with a group of about 5-7 runners. Took it really really easy at the beginning. at one point I heard one of the guys in the group say something about our pace being around 7 minute mile pace. By looking at my watch, I knew that wasn't the case, we were indeed going slow, but probably more like 6:30 pace. At that moment i decided to execute my race strategy which called for going out in 6:10 and then dropping. I pulled away and was all alone. Here at mile 3 we got into the stone park hills. I knew the hills were tough because I had driven the course the night before, but had no idea the massive toll they would take on my time for this race. For mile 3, there was just one big hill that added the 20 seconds to my otherwise 6 flat pace. Mile 4 was where things got ugly. Mile 12- 6:18.6 (1:15:29, 6:17 pace) Im hanging on still at the pace I set back at mile 8. At the start of the last mile, I have around 30 seconds on the 2nd place guy, he has gained but it has been somewhat negligable, its all about what each of us has left. Mile 13- 6:22.9, He kept coming and passed me at around 12.5, I just couldnt stave him off and had no answer to his final mile which was 5:50 (as i learned after the race) I definitely didn't have a 5:50 in me, the hills early on had threw off my plan, and my new goal of winning rested on what that guy had left, and he had enough to beat me. last .1- 42.9- No kick, just easing on in as I realize I cant move up or down in position. Turns out I ran a decent plan throughout the early stages of the race, the hills just threw me off and I never recovered my game plan after that. When it came down to me just trying to hold on for the win, I lost it in the late stages. Nothing to hang my head about though, the other guy just had more at the end, and probably had more experience at early hills. I took 2nd overall and netted $75 in prize money. Not a bad day, and considering I was just hoping to get a PR, and ended up finishing in the money. Also, I believe on a flat course, I would have easily PR-ed today and most likely broke 1:20. I felt well rested and well prepared mileage and speed wise. The hills just got the best of me, and the rest of my race suffered because of that. 1:22 on this course was a very good time in my opinion and I am happy with that! Very easy paced 5 miles today. Still really sore from saturday, especially my calves, i think my flats may be nearing the end of their lifespan. Overall, not as slow as I wanted to go, but it felt really slow, that first mile was a surprise with how sore i was. Will prolly do very similar pace for maybe 6 tomorrow. 5k this weekend and then maybe thinking about running my first full at the end of december, so I will be getting my mileage up after this week. Whew, i was just dead today. My legs had nothing in them. My calves are still really sore. 6 miles in 45:35 or 7:36 pace. I just felt awkward running from the first step. Maybe should have gone shorter today. Repeat 400s today, 14 of them to be exact with equal recovery.They were a little slower than usual because of the 20 mph headwind on the backstretch + the sleet and freezing rain. Overall, not pleasant weather. Total time for the 3.5 miles of 400 repeats was 18:49 or 5:22-5:23 per mile pace. Not bad considering the elements. 2.5 total w/u and c/d. Although today's miles are classified as easy, they were far from it. Temps in the mid-30s with wind chills in the 20s, pouring down cold rain was the weather. Got thoroughly soaked. 4.5 miles in 32:36 or 7:15's. Started off with a 6:58 but then reined it in and slowed down. Today I ran Des Moines Race for the Cure. 25,800 people showed up so that was pretty awesome. Got 5th, the course was long im pretty sure, the winner was a guy who always runs mid to low 15s and he was at 16:30, and I felt at least 17:30 was more realistic for what I ran. I woulda guessed the course was 3.3-3.4. Didn't get my splits cuz the miles werent marked, but it was a fun race for a great cause! Second year in a row medalling at this event!! Really glad that so many people came out for such an awesome cause!! Today I wanted to run 15-16 miles. Perfect weather for it too, low 50s and no wind, just a beautiful fall evening. Ended up stopping after 13. Just felt tired so I didnt push it. The 13 felt extremely easy though, plus I ran without GU or water, largely because i left all my GUs at my apt and I am home this weekend. That could have contributed to my abrupt stop at 13. Overall, you can see where I would normally GU (between 8 and 9) and since I didnt have any, that is where my miles started to slow. Overall a good run at a nice pace, felt relaxed and just enjoyed the run. Rough 5 this morning, did a quick turnaround from the long run yesterday and felt like poop today. 5 miles in 39:10 or 7:50 per mile, not a bad pace for recovery just felt really tired, which was expected. Overall a good workout on tired legs. I think if I rest up my legs I could run a lot faster, which is my plan here towards the end of the season. Im thinking that I probably will not attempt the full at the end of the year and instead just focus on running as many 5ks as i can before the year is out. Might even use next year as a solely 5k year where I try to break 16 the whole year. We shall see. So, in retrospect, not as slow as I thought I was going when I look at the average. I tried though, and its getting easier to run slower. The effort feels easy, so I think that is an important thing. Tempo 3 miles today. Weather was rough. high 30s with high winds and sleet, rain, snow mix blowing in my face. Overall, not a bad workout. I am going to try and peak these next two weeks as i have 2 5ks on each of the next two weekends. So I will be tapering and utilizing the year long base I have built of both speed and mileage. A nice spooky 3 miles this evening. In true halloween spirit, the run was at night and there was a full moon and smoke was hanging over almost my entire running route from leaf burning today. It was way awesome and definitely felt like halloween.